The Paralympic Games are over but its legacy lives on thanks to the amazing achievements of the 2012 champions – especially the ‘Boy from Brazil’. This was the expression chosen by the international news media when talking about Alan Fonteles after his stunning victory on the night of 2nd September. In just a few seconds Alan became a star by beating all-time favourite Oscar Pistorius in the T44 200 metres. He went from being an unknown athlete – even to most people in his own country – to become an Olympic gold medalist. “My biggest dream has always been to be remembered for achieving something in the Paralympics… And I believe it is already happening,” he said. “The time I crossed that finishing line, I knew I had written my name in history by beating the man who made it to the Olympics. Though my starting wasn’t that good, I made it through to win the race. I was ready and went there to do my best, always aiming for the podium”. Pistorius – known as the ‘blade runner’ – had never lost in the 200 metres and the South-African did not take Alan’s victory very well. After the race, he accused him of “bending the rules,” claiming Alan had used longer prosthetics than should be allowed in the competition. 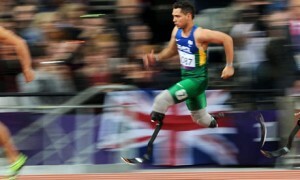 Paralympic leaders backed the Brazilian and Pistorius later apologised for his outburst. The incident was not enough to take away the magnitude of Alan’s victory. Alan was born in Marabá – a city in the Northern State of Pará, in Brazil – with a cognitive disease that blocked the full development of his legs. At only 21 days of life, both his legs were amputated after an intestinal infection caused septicaemia. He got his first prosthetics when he was nine months old and, by the age of three, had already learnt how to walk. His career in athletics started aged eight when Alan started competing with wooden prosthetics – which he used until he was 13 years old. Alan life was turned round in 2006 when he met Brazilian tri-athlete Rivaldo Martins, who had had part of his left leg amputated after a bus crash in 1996. After seeing that 13-year-old boy running with his unconventional prosthetics, Rivaldo decided to help. Rivaldo contacted Challenged Athletes Foundation, in USA, and together they funded Alan’s first real prosthetics. After that, he was launched on to the winning path in the athletics,including the World Championship, the Beijing and London Paralympics. This successful route is far to be over. Although Alan does not intend to follow on Pistorius’ footsteps competing in the Olympics, he is keen to take on able-bodied athletes in the ‘Troféu Brasil Triathlon’: “It is not a matter of proving anything to anyone. It is the only dream I’ve had since I was a child,” he told KissBank.com. No one doubts he will make it. This summer Alan Fonteles de Oliveira, the double-amputee boy from Brazil, joined the rare elite that will forever redefine the word ‘superhuman’ – Paralympic champion 2012.